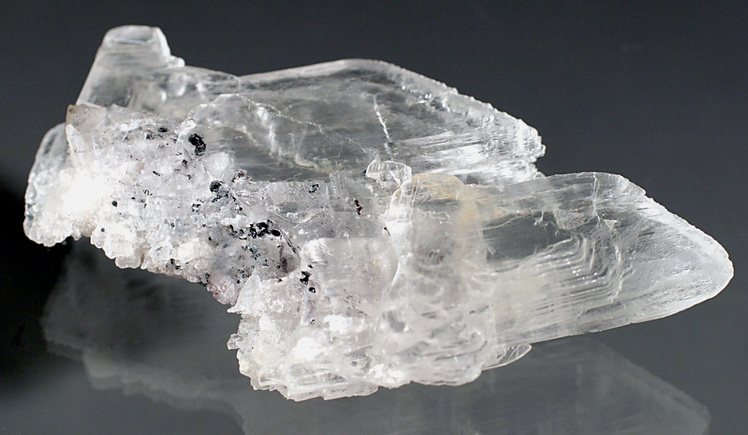 Selenite: Mineral information, data and localities. From the Greek σελήυη, for "moon," in allusion to the moon-like white reflections of the mineral or to the quality of the light transmitted by semi-pellucid gypsum slabs of cleavages used as windows. The name 'selenite' is mostly synonymous with gypsum but has been used historically to describe the transparent variety, as opposed to satin spar gypsum for the fibrous variety and alabaster for the fine-grained massive form. The original name was given by J.G. Wallerius in his 1747 book "Mineralogia, eller Mineralriket" (p.50), as 'selenites'. Named from the greek 'σεληνη' (the moon), probably from its pale bluish reflections. 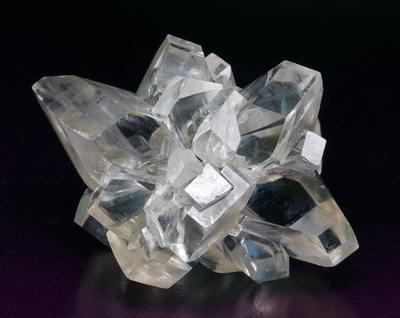 Visit gemdat.org for gemological information about Selenite. Dolomite 83 photos of Selenite associated with Dolomite on mindat.org. Quartz 80 photos of Selenite associated with Quartz on mindat.org. Calcite 69 photos of Selenite associated with Calcite on mindat.org. Halite 59 photos of Selenite associated with Halite on mindat.org. Siderite 44 photos of Selenite associated with Siderite on mindat.org. Limonite 43 photos of Selenite associated with Limonite on mindat.org. Aragonite 35 photos of Selenite associated with Aragonite on mindat.org. Malachite 32 photos of Selenite associated with Malachite on mindat.org. Pyrite 32 photos of Selenite associated with Pyrite on mindat.org. Chalcopyrite 25 photos of Selenite associated with Chalcopyrite on mindat.org. Wallerius, J.G. (1747) Mineralogia, eller Mineralriket. Stockholm: 50. Cronstedt (1758) Försök til Mineralogie, eller Mineral-Rikets Upställning. 12mo, Stockholm: 18. Palache, C., Berman, H., & Frondel, C. (1951), The System of Mineralogy of James Dwight Dana and Edward Salisbury Dana, Yale University 1837-1892, Volume II. John Wiley and Sons, Inc., New York, 7th edition, revised and enlarged, 1124 pp. : 482-486. The following Selenite specimens are currently listed for sale on minfind.com. Tauber, S. (2014). Visita a la zona, Noviembre de 2014. Juan C. Porto (1961) - "Yeso y Sulfatos Alcalinos en Vipos". Tucumán. Instituto Miguel Lillo. Universidad Nacional de Tucumán. Inédito. M. Ewing and J. L. Worzel et al (1969). SITE 2. Initial reports of the deep sea drilling project, 1, 84-110. Gill, E. D. (1973). Geology and geomorphology of the Murray River region between Mildura and Renmark, Australia. Memoirs of the National Museum of Victoria, 34, 1-97. Open Envelope No. 6384; EL 1304; Lake Greenly, Lake Malata Progress and final reports to licence expiry for the period 6-9-85 to 5-9-86; Submitted by John F. Gilfillan and Associates Pty. Ltd. 1987. England, B. M. (1982). Crystallized gypsum from the Playa Lake clays of Lake Gilles. 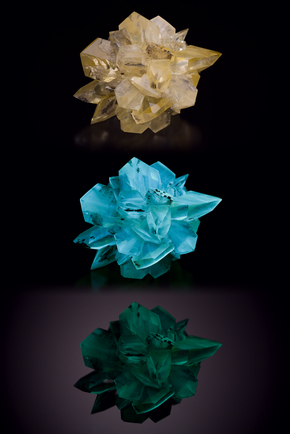 The Mineralogical Record, 13(3), 187-191. Personal Collection of Mark Willoughby. Sutton, P. (1986) Minerals from evaporative basins in the Mallee District, Murray Basin, south-eastern Australia. Australian Journal of Mineralogy, 10(1), 13-28. Grguric, B. A., Pring, A., Bevan, A. W. R. and Downes, P. J. (2006): The Minerals of Comet Vale, Western Australia. Australian Journal of Mineralogy (2006):12: 9-23. Exel, R. (1993): Die Mineralien und Erzlagerstätten Österreichs. Eigenverlag R. Exel, 447 pages. Kleemann, F. & Kleemann, A. (1992): Pulkauer Gipsrosen. MEFOS 3 (4), 6. Polz, A. 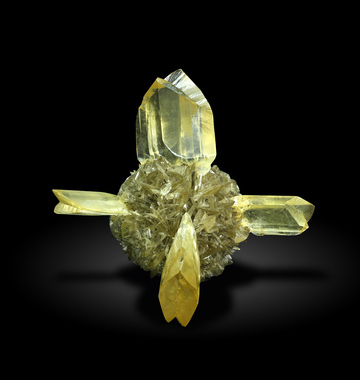 (1989): Mineralien aus Vorarlberg. Vorarlberger Verl.-Anst., Dornbirn, 80 pp. Matile, G.L.D., Betcher, R.N. 1998. Observations on selenite distribution within the Lake Agassiz clay plain, Manitoba Energy and Mines, Geological Services, Open File Report 98-6, 6 p.
Mr. António Manuel Ináçio Martins. ; Mineralogical Record 22:384-5; Matile, G.L.D., Betcher, R.N. 1998. Observations on selenite distribution within the Lake Agassiz clay plain, Manitoba Energy and Mines, Geological Services, Open File Report 98-6, 6 p.
Ann P. Sabina, Rocks & Minerals for the Collector: Geoligical Survey of Canada Miscellaneous Report 39. Page 138-140, Waterdown Area. Geological Survey of Canada Misc. Report 39. Sabina, A.P. (2003) Rocks & Minerals for the collector; Kirkland Lake - Rouyn-Noranda - Val d'Or, Ontario & Quebec. GSC Misc. Report 77, 195-196 p.
Ruiz Fuller C./Peebles F; "Geología de los yacimientos Metalíferos de Chile"; Fondecyt, Stgo de Chile, 1988. Krul, H. (1969) Geologische zwerftochten. N.V. W.J. Thieme & Cie - Zutphen, Netherlands, 161 pp. (in Dutch). Sarkar, S. C., Bhattacharyya, P. K., and Mukherjee, A. D., 1980, Evolution of the Sulfide Ores of Saladipura, Rajasthan, India, Economic Geology, 75:1152-1167. Marchi, C., Ghilli, G., and Guarguagli, M. (2005) Il Gesso dei tubi - Ponteginori (Montecatini V.C.). Notiziario del Gruppo Mineralogico "AUSER" di Cecina (LI), 2, 3 (Gennaio/Marzo 2005), 1-10; Orlandi, P. (2006) Siti di interesse minerario e mineralogico della Provincia di Pisa. Provincia di Pisa, Piano Territoriale di Coordinamento (approvato con Deliberazione di Consiglio Provinciale n. 100 del 27/07/2006), Pisa, 358 pp. Rocks & Minerals: 21: 568-569. Fraser, C. (1910) The Geology of the Thames Subdivision, Hauraki, Auckland. New Zealand Geological Survey, Bulletin No. 10 (New Series), New Zealand Government, Wellington, 136 pages. Hege Kilhavn, Ida Marie Gabrielsen, Rannveig Øvrevik Skoglund & Stein-Erik Lauritzen (2017) Mineral- and Fine-grain Sedimentology of the Reingardslia Karst, Rana, North Norway. In 17th International Congress of Speleology (No. I, pp. 257-260). Australian Speleological Federation Inc.
ⓘ Stamps and Jowl Zawn (Roscommon Cliff) ? Carruthers, R.G., and Strahan, A. (1923): Special Reports on the Mineral Resources of Great Britain, Vol. 26. HMSO Publications (London), 114 pp. ; Ford, T.D., Sarjeant, W.A.S., and Smith, M.E. (1993): UK Journal of Mines and Minerals 13, 16-55; Dewey, H., and Smith, B. (1922) Special Rep. Mineral Resources G.B. 23. Self collected. Bill Gordon collection. Garfield, L. and Wellings, D. (2008) Minerals of the Glamorgan Coast: Barry Island and adjacent areas. DVD, published by authors. ; Garfield, L. and Wellings, D. (2008) Extracts from 'Minerals of the Glamorgan Coast: Barry Island and adjacent areas.' Journal of the Russell Society, vol. 11, 64-70. Anthony, J.W., et al (1995), Mineralogy of Arizona, 3rd.ed. : 258; Witkind, I.J. & R.E. Thaden (1963), Geology and uranium-vanadium deposits of the Monument Valley area, Apache and Navajo Cos., AZ: 116, 121. Stone, R.W. (1920), Gypsum deposits of the US, USGS Bull. 697: 50. MRDS database Dep. ID file #10046172, MRDS ID #M241004. Stone, R.W. (1920), Gypsum deposits of the United States, USGS Bull. 697: 50. MRDS database Dep. ID file #10046248, MRDS ID #M241115. Stone, R.W. (1920), Gypsum deposits of the United States, USGS Bull. 697: 49. MRDS database Dep. ID file #10060144, MRDS ID #TC10101. Anthony, J.W., et al (1995), Mineralogy of Arizona, 3rd.ed. : 241; Peterson, N.P. (1962), Geology and ore deposits of the Globe-Miami district, AZ, USGS PP 342. Peterson, N.P. (1962), Geology and ore deposits of the Globe-Miami District, Arizona, USGS PP 342: 75. Keith, Stanton B. (1978) State of Arizona Bureau of Geology and Mineral Technology, Geol. Sur. Br. Bull. 192, Index of Mining Properties in Yuma Co., Arizona: 115 (Table 4); Arizona Bureau of Mines file data. Keith, Stanton B. (1978) State of Arizona Bureau of Geology and Mineral Technology, Geol. Sur. Br. Bull. 192, Index of Mining Properties in Yuma Co., Arizona: 115 (Table 4). Phillips, K.A. (1987), Arizona Industrial Minerals, 2nd. Edition, Arizona Department of Mines & Minerals Mineral Report 4, 185 pp. MRDS database Dep. ID file #10023690, MRDS ID #I001098. Phillips, K.A. (1987), Arizona Industrial Minerals AZ Dept. of Mines and Mineral Resources Mineral Rpt. 4; MRDS file #10023694. Galbraith, F.W. & D.J. Brennan (1959), Minerals of AZ: 60. Anthony, J.W., et al (1995), Mineralogy of Arizona, 3rd.ed. : 242; Peirce, H.W. & T.A. Gerrard (1966), Evaporite deposits of the Permian Holbrook Basin, AZ, 2nd. Symposium on Salt. Northern Ohio Geological Soc., Inc. 1: 1-10; Stone, R.W. (1920), Gypsum deposits of the US, USGS Bull. 697: 51; Galbraith, F.W. & Brennan (1959), Minerals of AZ: 60. Mr. Roy Parsons, Huachuca City, AZ. Anthony, J.W., et al (1995), Mineralogy of Arizona, 3rd.ed. : 185, 242. Anthony, J.W., et al (1995), Mineralogy of Arizona, 3rd.ed. : 242. MRDS database Dep. ID file #10026738, MRDS ID #M000021. MRDS database Dep. ID #10037125, MRDS #M030504. Anderson, C.A., et al (1955), Geology and ore deposits of the Bagdad area, Yavapai County, Arizona, USGS PP 278: 51, 77. Wilson, E.D. (1933), AZ Bur. Mines Bull. 134: 43. Rocks & Min. :63:115; Lock, et al(1983). Bailey, Gilbert E. (1902), The saline deposits of California: California Mining Bureau Bulletin 24: 172; Pemberton, H. Earl (1983), Minerals of California; Van Nostrand Reinholt Press: 285. Pemberton, H. Earl (1983), Minerals of California; Van Nostrand Reinholt Press: 285. Kampf, A. R., Mills, S. J., & Nash, B. P. (2016). PREPUBLICATION: Pauladamsite, Cu4 (SeO3)(SO4)(OH) 4· 2H2O, a new mineral from the Santa Rosa mine, Darwin district, California, USA. Mineralogical Magazine. Morgan, V. and Erd, R.C. (1969) Minerals of the Kramer borate district, California California Division of Mines and Geology Mineral Information Service: 22(9&10): 152; Pemberton, H. Earl (1983), Minerals of California; Van Nostrand Reinholt Press: 286. Troxel, Bennie Wyatt & P.K. Morton (1962), Mines and mineral resources of Kern County, California: California Division Mines & Geology County Report 1, 370 pp. : 197-209; Pemberton, H. Earl (1983), Minerals of California; Van Nostrand Reinholt Press: 286. Pemberton, H. Earl (1983), Minerals of California; Van Nostrand Reinholt Press: 286-287; Sharp, W.E. (1959) Minerals from Los Angeles County, California. Printed privately, Los Angeles, California: 22. Rader, W.L. (1989), Calabasas Highlands Selenite Crystals. Bull. Min. Soc. So. Calif.: 59(7) (Jul 1989): 11. Russell, Israel Cook (1889), Quaternary history of Mono Valley, California: USGS 8th. Annual Report: 311; Pemberton, H. Earl (1983), Minerals of California; Van Nostrand Reinholt Press: 287. Woodford, A.O., Crippen, R.A., and Garner, K.B. (1941) Section Across Commercial Quarry, Crestmore, California. American Mineralogist: 26: 368; Pemberton, H. Earl (1983), Minerals of California: 287. Allen, Robert D. & Henry C. Kramer (1953), Occurrence of bassanite in two desert areas in southeastern California: American Mineralogist: 38: 1266; Ver Planck, Wm. E., Jr. (1952), Gypsum in California: California Division Mines Bulletin 163: 48; Pemberton, H. Earl (1983), Minerals of California; Van Nostrand Reinholt Press: 287. Murdoch, Joseph & Robert W. Webb (1966), Minerals of California, Centennial Volume (1866-1966): California Division Mines & Geology Bulletin 189: 211. Murdoch, Joseph & Robert W. Webb (1966), Minerals of California, Centennial Volume (1866-1966): California Division Mines & Geology Bulletin 189: 211; Pemberton, H. Earl (1983), Minerals of California; Van Nostrand Reinholt Press: 288. Gale, Hoyt Stoddard (1914c), Borate deposits in Ventura County, California: USGS Bulletin 540: 446; Murdoch, Joseph & Robert W. Webb (1966), Minerals of California, Centennial Volume (1866-1966): California Division Mines & Geology Bulletin 189: 211; Pemberton, H. Earl (1983), Minerals of California; Van Nostrand Reinholt Press: 288. Eckel, E.B. (1997) Minerals of Colorado. Updated and revised by Cobban, R.R. et al. Fulcrum Publishing, Golden, Colorado, 665 pages. Januzzi, Ronald E. (1959): The Minerals of Western Connecticut and Southeastern New York. The Mineralogical Press, Danbury, Connecticut. ; Januzzi, Ronald E. (1976): Mineral Localities of Connecticut and Southeastern New York State. The Mineralogical Press, Danbury, Connecticut. ; Ryerson, Kathleen H. (1972): Rock Hound's Guide to Connecticut. Pequot Press. Gems & Minerals 395:28-29 (1970). Rocks & Min. : 21:144-145; Ostrander & Price (1940), Minerals of Maryland: 27. Robinson, Samuel (1825): A Catalogue of American Minerals, with Their Localities, p.49. Gleba, 1978. Massachusetts Mineral & Fossil Localities; Emerson, B. K (1882) The Deerfield Dyke and its minerals. American Journal of Science 3rd series XXIV:270-278,349-359. Rocks & Min. : 58: 108. Pollack, R. (1977) Riker Hill, New Jersey -- An Active Collecting Area. Rocks & Minerals, 52:542. Mins. of NYC & Its Environs, NY Min. Club (1931), Manchester, J.G. ; 59-157-183 (1984), Peters, Joseph J.; NJ Geol. Survey Bull. #64 (1960), Mason, B. Minerals of Laurel Hill, Secaucus, NJ, Facciolla, N.W. (published privately). Mineralogical Record: 9:157-179., Peters, T.A. & Peters, J.J. (1978); Rocks & Min. : 59:157-183, Peters, Joseph J. (1984). Mineral Collector 15: 113-118, Papke, H. (1908); Rocks & Min. : 59:157-183, Peters, Joseph J. (1984). Lapidary Jour. : 32:1700-1720, Mins. of the Watchungs, Part II, Vitali, G. (1978); Rocks & Min. : 59:157-183 (1984), Peters, J.J.; Quest for NJ Mins., R. Speiser (1978): 18. Kent, B.P. and Butkowski, B. (2000): Minerals of the Millington Quarry, Somerset County, New Jersey. Mineralogical Record, 31: 411. Donald G. Davis - Extraordinary features of Lechuguilla Cave, Guadalupe Mountains, New Mexico. Journal of Cave and Karst Studies 62(2): 147-157. Minerals of New Mexico 3rd ed. ; J. H. Schilling, (1956) Geology of the Questa Molybdenum Mine Area, Taos County, New Mexico. NMBGMR Bulletin 51. Jensen, David E. (1942), Minerals of the Lockport dolomite in the vicinity of Rochester, N.Y. Rocks & Minerals: 17(6): 199-203. Bordovsky, Dr. Paul (2006), personal contribution to Mindat.org. Onac, B., Veni, G. & White, W. B. (2001). Depositional environment for metatyuyamunite and related minerals from Caverns of Sonora, TX (USA). European Journal of Mineralogy, 13(1), 135-143.
ⓘ Big Rock Candy Mt. Mitchell, R.S. (1962) New occurrences of jarosite in Virginia. American Mineralogist, 47, 788-789.